Marit Allen wore this bold black and white optical-check suit in 1964. It is an early design by Marion Foale and Sally Tuffin, who worked together from 1961-1972. They were known for their lively, graphic and very wearable designs intended for active young women to wear in a wide range of circumstances. They were among the first designers to regularly create tailored trouser-suits for women, although this crisply cut jacket is paired with a more traditional skirt. Marit Allen (1941-2007) was a leading British fashion journalist who started as an assistant at Queen magazine in 1961. In 1964, she joined British Vogue, where she stayed for ten years. Her 'Young Idea' pages were hugely influential. Many young and innovative designers, such as John Bates and Foale & Tuffin, received significant exposure through Allen, who not only gave them magazine coverage, but happily wore their clothes herself. Woman's skirt suit. Long line tailored double-breasted wool jacket with a rolled collar and wide lapels, made from medium check wool, black and white, with short skirt made from a larger scale black and white check wool, cut on the cross so that the checks appear as diamond shaped. Both jacket and skirt are unlined. 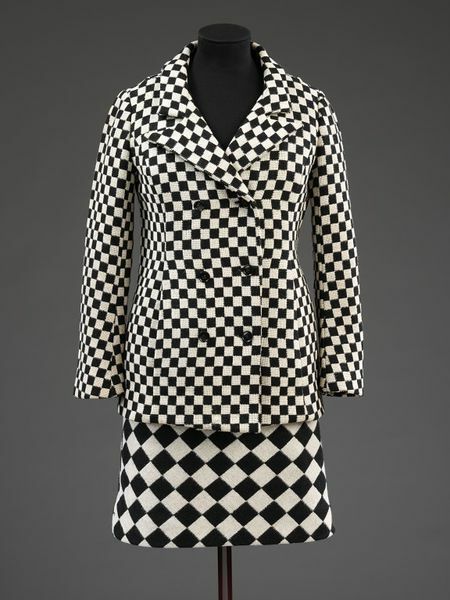 This suit was worn by the fashion journalist Marit Allen (1941-2007). She entered fashion journalism in 1961 when she became an assistant at Queen magazine. She quickly gained control of the "About 20" pages of the magazine, in which she showcased young design talent and innovative photography. When Beatrix Miller, the editor of Queen, went to edit Vogue in 1964, she took Marit with her. For ten years, Marit Allen worked as a fashion editor on the magazine. Her "Young Idea" pages, written and captioned by herself, showcased innovative young design and fashion, and had a great influence on 60s fashion. Marit Allen was often photographed for her own stories. The suit was photographed for a 'Young Idea' spread published 1st September 1964, and was originally retailed by the '21 Shop' , an influential boutique housed in the Woolland's department store, where it cost 16 guineas. 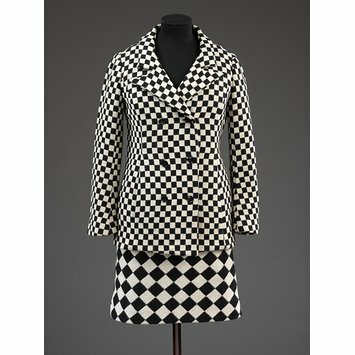 Skirt suit, jacket and skirt, black and white optical check wool, Foale & Tuffin, London, 1964.